Agroecology is a new model of development based on farming and land use practices in an ecological and common good perspective centered around traditional and popular knowledge and culture. In Brazil, the National Association of Agroecology (ANA) has brought together several hundred farmers’, women’s, artists’ and activists’ organizations over the course of the last fifteen years. Every four years they organize a national meeting of agroecology (RNA) in order to strengthen this network and share the know-how. The fourth edition was held this year between May 31 and June 3 in the city of Belo Horizonte (south-east Brazil) with the theme of the link between the city and the countryside for the production of a healthier diet. In addition to 2000 participants from different regions of Brazil, there were also about fifty people from 14 other countries. The Catholic Committee against Hunger and Development (CCFD) was one of the participants who made the trip. The French organization has defended the right to land on all continents for more than 50 years. Its presence is due to the institutional support partnership that was signed with ANA in 2016 as part of a global program on ecological transition based on the knowledge of traditional communities. In Latin America, in addition to Brazil, CCFD supports organizations in 10 other countries including Mexico, Peru, Ecuador and Haiti. “The Latin American experience is of great interest to us because it develops a political approach to agroecology that goes far beyond the sole issue of agriculture. In addition to the debate on organic food production and soil protection, the movement manages to link other central axes such as decent work, gender equality or the struggle for democracy”, explains Martin Willaume of CCFD. “This approach does not exist in other parts of the world, for example in Africa where the movement works in a mainly technical line. We are interested in understanding how this articulation is built to then bring the experience there, “he adds. Willaume reports that there are several agroecological experiences on the continent that intertwine with other political agendas. In Bolivia, for example, agroecology has become a central focus in the process of building indigenous self-government in accordance with the Plurinational State’s legislation. 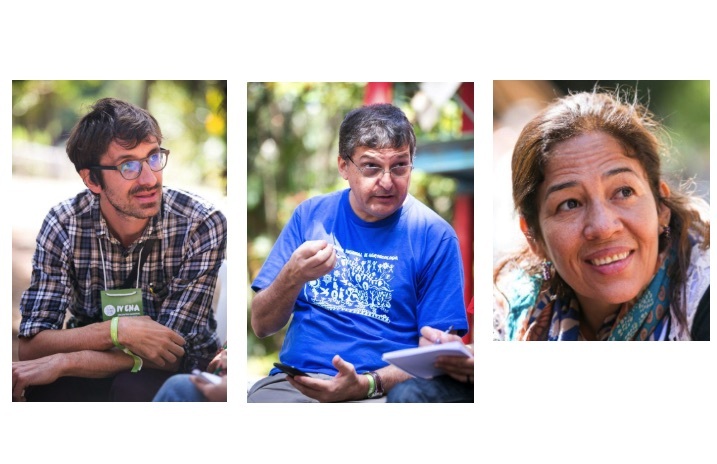 In Peru, the movements build agroecology as a means of fighting against mining, and in Colombia, the agroecological movement combines the issues of the peace process in the struggle. Paulo Petersen, member of the ANA Executive Committee, explains how important these international alliances are, especially in the context of Brazil today. “The very nature of agroecology is transversal. If we take the 17 Sustainable Development Goals [adopted by the United Nations], we realize that agroecology covers the majority: climate, water, the fight for gender equality, against poverty, hunger, decent work, etc., “commented Peterson. Peterson explains that several Latin American organizations have contacted the ANA to participate in the RNA and also underlines that these exchanges of knowledge are important to allow the movement to continue to innovate and enrich new ideas. Brazil is a pioneering articulation force on the continent. Among the Latin American representatives was Colombian Patrícia Candela Orozco who went to Brazil to learn about the RNA experience. She represents the Instituto Mayor Campesino (IMCA), located in the Valle del Cauca region, near Cali, an organization that has been working for 57 years with peasant communities. According to Patrícia, Brazil is a pioneer in the development of agroecology in Latin America. She says she was very impressed with the methodology called “mystic”, which is developed with music, theater and poetry. This is used to welcome meeting participants, to celebrate victories, to strengthen struggles or to introduce or contextualize debates in diverse spaces, in addition to fostering greater interaction with and among participants. “The fact of adding the spiritual part of the people gives more strength to the messages of that struggle. If each one lives this message inside of himself, he will be able to transmit it more easily to the rest of the people”, she says. The broad participation in the fourth ENA was another point that impressed Candela. In Colombia, the IMCA was involved in the construction of the first national farmers’ meeting, which took place in 2017 and involved various civil society organizations. Patrícia highlights how difficult it is to hold an event of this size. The Brazilian experience in the ENA left her inspired.